I'm not answering a reader question this time; just passing on some useful information. 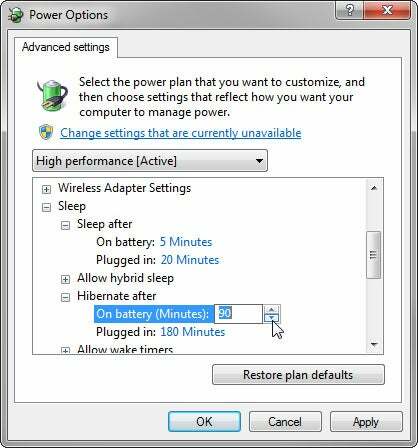 You can save power by setting up your Windows PC to go into sleep mode (called Standby in XP) after so many minutes without use. You can save even more power by having it go from sleep to hibernation after a longer period of neglect. Both modes save power, and can bring you back to the same place you were at before you powered down. While sleep mode cuts down on power consumption considerably, your computer is still on. It still needs electricity to keep Windows, currently-running applications, and open files in RAM. But when a PC hibernates, it copies everything in RAM to a file on the hard drive, then shuts down the PC completely. Hibernation saves more power, but it's slower. A modern PC can go in and out of sleep almost instantaneously. It can take more than half a minute to hibernate, and another half minute to wake up. If you're using Windows XP, right-click the desktop and select Properties. Click the Screen Saver tab, then the Power button. Click the Hibernate tab and check Enable Hibernation. Click the Apply button. 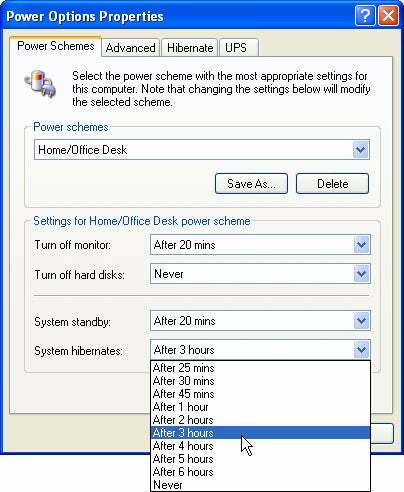 Then click the Power Schemes tab for standby and hibernate options. In Vista or Windows 7, click Start, type power, and select Power Options. In the left pane, click Choose when to turn off the display. You'll find a Sleep option there, but nothing about hibernation. So click the Change advanced power settings link. Expand the Sleep section for "Sleep after" and Hibernate after" options.